It has already been learnt that, brain receives two sets of branches from arteries of both vertebrobasilar and carotid system. These are cortical and central. 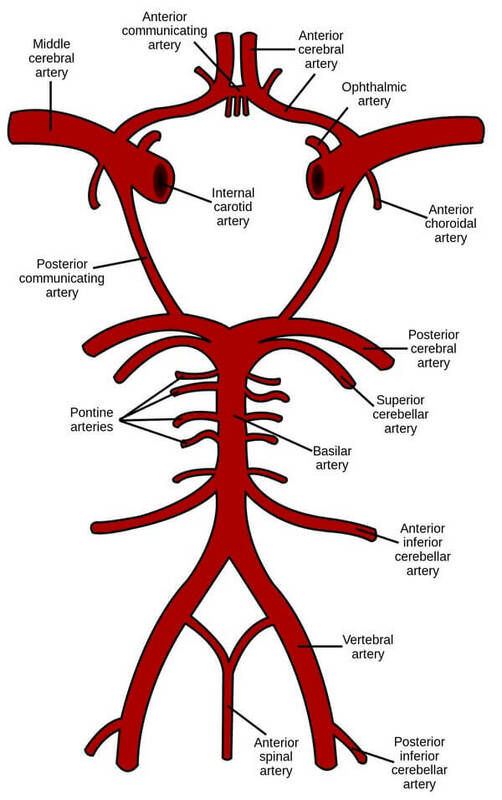 Branches from circle of Willis are all central. These are also called nuclear or ganglionic branches which are example of end arteries. Branches are divided into following four groups. One of the lateral striate arteries supplying posterior limb of internal capsule presents a long course. It is called Charcot’s artery of cerebral hemorrhage. Because of its length, it is more prone to be damaged in cerebrovascular accident. Medial striate arteries ascend medial to lentiform nucleus and supply Caudate nucleus and Internal capsule. Medial part of thalamus forming lateral wall of third ventricle. Central branches of circle of Willis are also known as ganglionic or nuclear branches, because in the central core of brain, these branches not only supply important fiber bundles like internal capsule, but also many of them supply submerged collection of gray matter which are called basal ganglia or basal nuclei. All the central branches are example of end arteries having no anastomosis in precapillary level. So, once one of these arteries are affected due to hemorrhage, thrombosis or embolism, area of brain supplied by that artery will suffer from irreversible damage.